Welcome to my feeble attempt at creating a homeschooling blog. For the longest time I was actually afraid of making one – because I really don't have all the answers yet. I'm a new homeschooling mom who sometimes worries if I am doing a good job – who worries if I can handle it. Well, I don't know the answer to those questions – except to say "Insha'Allah" because that's my job now and I have to take it completely seriously. In the past I have had several projects – things I enjoyed doing. However, since we are now actually traveling the road to homeschool in our house all projects are off-limits. Homeschooling is now my main priority – and trust me, it keeps me busy! What do I expect out of this blog? I know for one thing – I don't expect to post every day, probably not even every week. Time is crucial and the more distance I make between myelf and the computer – the more things get done! However, I have never enjoyed learning something and not having the opportunity to share it with someone else. If we don't help one another, how can we ever succeed? So, I am hoping that whenever I come across anything that I believe is possibly beneficial to someone out there – I will try to post it as soon as I can. Who knows, perhaps if we work together we can make a difference. There's only one thing I am certain of – I'm willing to try. Jazaaki Allaahu khairan for such a wonderful blog. Do you mind if I link you on mine? 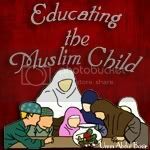 I had started a blog a while back at http://muslimaat-homeschooling.blogspot.com but I kind of just stopped. I had plans of doing some similar things like your What is the Qur’aan lesson plan. I am working on a website actually and want to add a homeschooling section to it bi’ithnillaah. Copyright © 2014 Educating the Muslim Child. All Rights Reserved.